First, the NYT’s Room for Debate series asks the important question: Are we ready for the next recession? As OTE regulars know, I say “no,” based on monetary policy, fiscal policy, and politics (otherwise, we’re fine…). I enjoyed other entries that stressed the importance of direct job creation programs, which make a lot of sense, especially in disadvantaged communities that won’t be reached by full employment. We can argue about that, but there’s no denying that D-F was put in place precisely because under-regulated financial markets helped inflate the housing bubble which kinda blew up the economy. So, if we’re thinking about ways to stave off the next downturn, I think it’s a very bad idea, if not downright amnesiac, to advocate deregulating financial markets. Next, a piece of persistent racial disparities in the economy, with many compelling pics, over at WaPo. I didn’t include the figure below, in part because it is not racial specific. But these are very important data showing the extent to which the US fails to invest in early childhood, a choice with serious long-term costs and obvious negative racial implications. 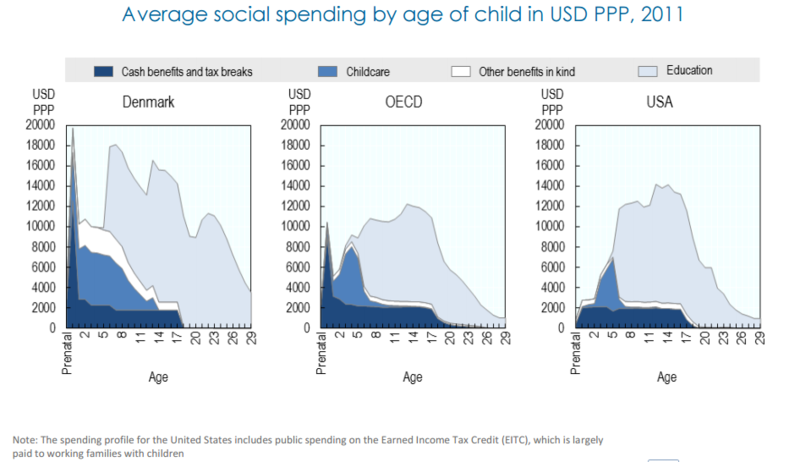 It compares average public spending per child, by age and type of spending, between the United States, Denmark and the OECD countries combined (that’s the Organization of Economic Cooperation and Development, which includes the advanced economies and some of the emerging ones). While we clearly invest a lot less in kids than the Danes, at first glance, the United States doesn’t look that different from the rest of the OECD. But look at the left end of the graphs. We invest much less in young children, and that stems largely from the fact that most other advanced economies view early childhood education, child care and other benefits targeted at parents with young children as “public goods,” meaning investments that, absent public support, would be insufficiently made from the perspective of society’s well-being. Finally, the Brussels branch of Politico asked a number of us to hold forth on the question: is free trade dead? Here’s my entry, but see others, as well. How we got here is an interesting and relevant question, but I’m glad we’re having this debate. Jared Bernstein is a senior fellow at the Center on Budget and Policy Priorities. From 2009 to 2011, he was chief economist to U.S. Vice President Joe Biden and a member of President Obama’s economic team. Free trade is not dead, but it’s in serious need of a progressive overhaul. In advanced economies across the globe, expanded trade and globalization face an existential crisis: for large swaths of the European and American electorate, the current trade model is non-representative, undemocratic, and perceived — often justly — as contrary to their economic interests. For decades, arrogant economic elites have told voters and communities negatively impacted by free trade deals that they simply failed to appreciate the benefits of the global economy. Out-of-touch trade advocates ignored the growing divergence of economic outcomes. They failed to forecast the predictable backlash by those unwilling to accept low wages and the loss of factory jobs as a fair price to pay for the benefits of free trade. Those of us who recognize these social costs and yet still value globalization must introduce a new model, or yield to the atavism of Trump and Brexit. Working people, not corporate and investor interests, must be at the center of this model. Trade deals must enforce labor and environmental standards, eschew patent extensions and intellectual property rules that are more in line with protectionism than free trade, and block currency manipulation. We should eliminate provisions that allow investors to challenge sovereign laws, and make the negotiating process more transparent. We must also invest in those people hurt by free trade agreements. In the European context, this means targeting unemployment and wage stagnation as opposed to fiscal austerity. By putting working people at the center of our trade regimes, we may be able revive support for them. Share the post "References/Links to stuff you might like: recession, race, and trade"
3 comments in reply to "References/Links to stuff you might like: recession, race, and trade"
Your defense of free trade agreements is well stated. But all of the populist offsets you propose were promised before adoption of previous free trade agreements, starting with NAFTA, the granddaddy of them all. National sovereignty? A Canadian pipeline company is suing the USA seeking to be made whole because we canceled their Keystone XL pipeline. Reparations and retraining for displaced workers? Crickets. So most of us think that we’ve borne all the costs and get little or no benefits. It’s possible to waste vast sums of money on child social spending too. New York, New Jersey, and Massachusetts average around $20,000 per pupil per academic year, and no one can possibly think they get their money’s worth. Even allowing for special needs and other costs factored into that average, one teacher is managing 25 students for 9 months from 8:30 to 3:00 pm in most cases, which at 25 * $25,000 = $550,000. Obviously the teacher sees a sliver of that in actual salary. What’s going on here? Also, we don’t need any more trade agreements. China already has a ridiculous most favored nation status for the U.S. Japan doesn’t really have open markets. Reversing globalization should be a goal, trade is not inherently good. Let’s explore the huge deficit with Canada first, is that all shale oil? Car parts? Hockey players?